Atos IT Solutions and Services, s.r.o. is a Czech Republic-based subsidiary of Atos SE (Societas Europaea). Atos SE provides digital services with annual revenue accounting for EUR 11 bil employing 93,000 employees in 72 countries in 2014. Serving a global client base, the Group provides Consulting & Systems Integration services, Managed Services & BPO, Cloud operations, Big Data & Cyber-security solutions, as well as transactional services through Worldline. The Company works with clients across different business sectors such as Defense, Financial Services, Health, Manufacturing, Media, Utilities, Public sector, Retail, Telecommunications, and Transportation. This Annual Statistical Dossier offers a comparison of 14 companies from Czech IT Industry from 1990 to 2017 on an annual basis. The report can be downloaded as an Excel file. You will find here the key numbers from the company's balance sheet, income statement, cash flow and the main ratios related to the firm's business. If you are only interested in particular areas of the company's business, you can find and download specific indicators from the company's Corporate Profile, or specific charts from the company's Chart Section. Download a sample excel file attached to see more details. On purchase, the hidden cells will be unlocked and all available data wll be visible. This Annual Statistical Dossier offers a summary of Atos IT Solutions Czech Republic's performance between 2003 and 2017 on an annual basis. The report can be downloaded as an Excel file. If you are interested in the company’s quarterly figures, please refer to the company’s Quarterly Statistical Dossier. Who Created the Largest EBITDA Among Czech IT Industry in 2017? Based on a comparison of 14 firms among Czech IT Industry, AVAST Software generated the highest earnings before interest cost, taxes and depreciation (so called EBITDA) in 2017 followed by Atos IT Solutions Czech Republic and Unicorn Systems. 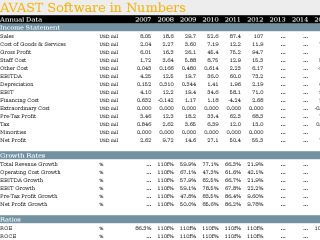 AVAST Software made EBITDA of CZK 6,363 mil, up 121% compared to the previous year. Historically, the firm’s EBITDA reached an all time high of CZK 6,363 mil in 2017 and an all time low of CZK 86.2 mil in 2007. The average profit in the last five years amounted to CZK 3,146 mil. The company generated an average EBITDA margin of 55.7% for its shareholders in the last five years with a maximum of 68.7% and a minimum of 34.6%. Comparing AVAST Software with its closest peers, Atos IT Solutions Czech Republic generated EBITDA of CZK 61.9 mil with a EBITDA margin of 4.77% in 2017, Unicorn Systems grossed CZK 54.5 mil (EBITDA margin of 2.60%) and Ness Czech Republic announced a profit of CZK 42.5 mil translating into a margin of 4.64%. You can see all the companies ebitda data on the EBITDA indicator page or you can download a special statistical dossier on the Czech IT Industry in the reports section. Who Was the Most Indebted Among Czech IT Industry in 2017? Based on a comparison of 14 firms among Czech IT Industry, Unicorn Systems had the biggest debt relative to its equity at the end of 2017 followed by AVAST Software and Ness Czech Republic. Unicorn Systems net debt reached CZK 46.7 mil. and accounted for 20.0% of equity at the end of 2017. The ratio is up 169% when compared to the previous year. Historically, the firm’s net debt to equity reached an all time high of 76.6% in 2006 and an all time low of -27.1% in 2000. When compared to EBITDA, net debt amounted to 0.856x at the end of the year. The ratio reached an all time high of 2.01x in 2011 and an all time low of -0.736x in 2000. Comparing Unicorn Systems with its closest peers, AVAST Software posted net debt to equity of -18.5% and -0.296x when compared to EBITDA at the end of 2017. Ness Czech Republic ended the year 2016 with a net debt at -44.6% of equity and -2.58x when compared to its EBITDA while ICZ had net debt at -81.0% of equity and -8.07x to EBITDA at the end of the year. You can see all the companies net debt/equity data on the Net Debt/Equity indicator page or you can download a special statistical dossier on the Czech IT Industry in the reports section. Who Created the Highest Margins Among Czech IT Industry in 2017? Based on a comparison of 14 firms among Czech IT Industry, AVAST Software generated the highest EBIIDA Margin in 2017 followed by Vema and Atos IT Solutions Czech Republic. AVAST Software made EBITDA of CZK 6,363 mil, which translates into EBITDA margin of 41.7%. Historically, the firm’s margin reached an all time high of 68.7% in 2011 and an all time low of 34.6% in 2016. The average EBITDA margin in the last five years amounted to 55.7%. Comparing AVAST Software with its closest peers, Vema generated EBITDA of CZK 22.6 mil with a EBITDA margin of 16.5% in 2017, Atos IT Solutions Czech Republic grossed CZK 61.9 mil (EBITDA margin of 4.77%) and Ness Czech Republic announced a profit of CZK 42.5 mil translating into a margin of 4.64%. You can see all the companies ebitda margin data on the EBITDA Margin indicator page or you can download a special statistical dossier on the Czech IT Industry in the reports section.